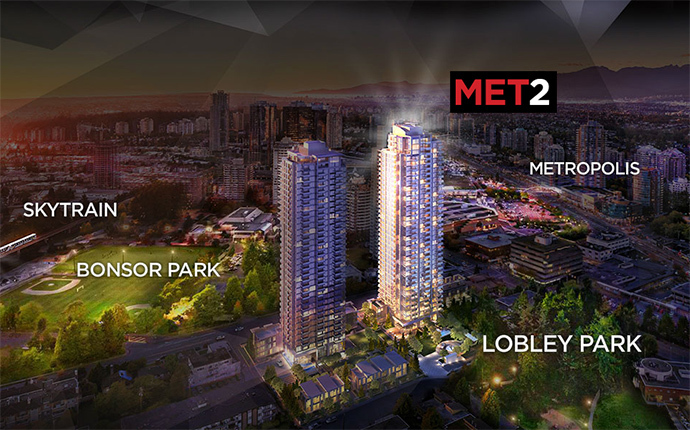 The Vancouver Condo Buzz » Introducing MET 2 Burnaby Metrotown Condo High-Rise by Concord! 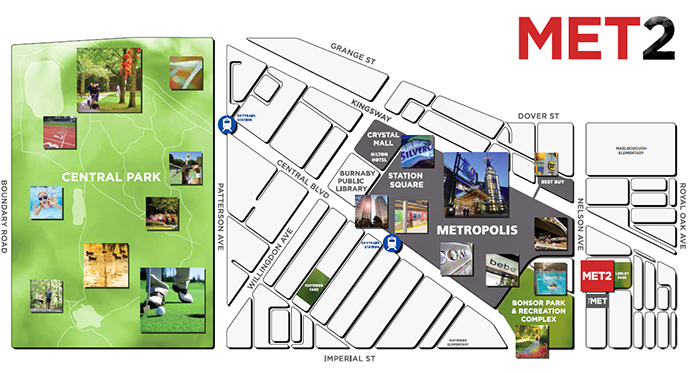 Grand Opening featuring 1, 2 & 3 Bedroom MET2 Condos & Townhouses! Selling out in a mere few days last year, THE MET was truly a sensational project with a unique and desirable park surroundings. MET 2 promises similar top urban conveniences of Metrotown, Skytrain access as well as added first class features such as indoor swimming pool, bowling alley and central air conditioning. 1, 2, 3 bedroom homes starting from $279,900 will be made available for pre-purchase in early 2014! 5 Diamond Residences with Park Front Surroundings are coming soon! Metrotown Burnaby location at its best. Surrounded by Bonsor Park and Lobley Park, steps away from Metropolis, BC’s largest shopping centre and Bonsor Community Centre is MET2 Metrotown condo tower, the latest development by leading developer Concord Pacific (also Canada’s largest community developer and multiple award winner last year!). Residents of MET2 Burnaby condos will enjoy a magnificent 5 diamond luxurious lifestyle that includes concierge service in the grand lobby and amenities such as a heated indoor swimming pool, hot tubs, golf simulator, 10 pin bowling alley, lawn bowling and so much more. Burnaby MET2 Condos is the most glamour and dynamic residences in the Metrotown real estate district. Starting from $279,900, the MET2 Burnaby condos by Concord Pacific will present one, two and three bedroom floor plans, so that there is a residence for every home buyer. The price point also includes parking, central air conditioning, high ceilings, marble walls and marble floor. REGISTER NOW at MET2.ca. Burnaby MET2 Condos present the best Metrotown condo value for 2014, so don’t miss out! Much has been written about how homebuyers are increasingly naming on-site amenities as one of the most important factors in their purchase decision. Here at Concord Pacific’s MET 2 Burnaby condo tower, new homebuyers will welcome the addition of many five star resort style amenity spaces. We’ve already written about the first tower amenities in a previous post, so we’ll talk about the MET2 Metrotown condo amenity spaces here. There will be a beautiful and commissioned art and water feature near the entrance along with a grand entrance lobby with concierge services/security desk. In addition, the 2nd tower at the Metrotown MET2 Burnaby condo tower will include a yoga and dance studio in addition to a card and Mahjong room. There’s a heated indoor swimming pool in addition to hot tubs and an outdoor lounge and sun tanning terrace deck. Other 5 star resort amenities include men’s and women’s change room, sauna and steam rooms in addition to a beautiful cascading water feature. There is a grand motor court with artistic centre piece and water feature in addition to a bowling alley! The MET1 Burnaby condo tower will have the golf simulator, karaoke lounge, cocktail lounge, catering kitchen/grand dining room, outdoor lounge with fire pit and fitness centre. As a MET2 Burnaby condo owner, you’ll have access to both tower amenity spaces. Just like in the phase 1 tower, Concord Pacific has carefully selected the best finishes and features seen in the Burnaby Metrotown real estate district offering. The interior and outdoor living space will feature 8’8” ceilings in most areas with some homes having 9’4” ceiling heights. There are terraces/balconies (outdoor living spaces) for most floor plans and 2 interior colour schemes that include Hamptons (light palette) and Manhattan (dark palette). As well, the outdoor spaces have gas outlet and hose bib and the interior main living areas, flex space and some bedrooms have wide plank laminate floors. Bedrooms in townhomes and most condo layouts will have premium carpeting. The laundry closets have marble flooring and the bedrooms will have organizers. The window coverings include roller shades for added privacy. In addition, the presale Burnaby MET2 Condo features include stacked front loading washer and dryer in every home as well as central heating and air conditioning. The ensuite bathroom or 1st bathroom will have a tub/shower combination in addition to laminate vanity with soft close hardware and slide out drawers. In addition, the presale Burnaby MET2 condos will feature engineered quartz stone counters, under mount sink with polished chrome Kohler faucet in addition to a tub with marble tile apron front. There’s recessed pot lights, dual flush toilet with soft close seat, polished chrome Kohler faucet, tub spout and shower head and large format marble tiled flooring and tub/shower surround. The ensuite bathroom at the Metrotown MET 2 Burnaby condos will also have custom medicine cabinetry with shelves, built in lighting and large mirror. The 2nd bathroom (wherever applicable) will have a walk in shower with same finishes as the ensuite in addition to mosaic marble tiled shower floor and hand held Kohler chrome sliding shower. The boutique Burnaby MET2 Townhomes will feature powder rooms with pedestal sink, large format marble tiled floors, dual flush toilet with soft close seat, recessed pot lights and designer wall sconce. The kitchens at the MET 2 Metrotown development will introduce laminate cabinetry with open glass display shelving and under cabinet lighting, cabinets featuring soft close hardware and waste recycling bin/sliding basket under the sink in addition to magic corners in select floor plans. Other kitchen features include engineered quartz stone counters, marble tiled backsplash, track or pot lights, large single bowl sink and polished Kohler chrome faucet. The integrated stainless steel appliance package at the new Metrotown MET2 Burnaby condos will include a bottom mount counter depth fridge with integrated panel, hood fan, dishwasher with integrated panel, gas cooktop, wall oven and microwave installed with trim kit. The 1 bedroom floor plans will feature 24” appliance package whilst the 2 bedroom and up suites will have 30” appliance package with a 24” dishwasher. The MET2 Burnaby condo upgrade features include an option to upgrade to integrated Miele appliances in addition to engineered hardwood flooring in some bedrooms, flex space and main living areas.